I am not going to say “please stop making found footage movies”, but I am going to say “please stop making boring, typical found footage movies”. If there was any place that I thought could make an interesting found footage movie, it would be South Korea. Over the past decade, South Korea has put out some of the best and most original takes on genre film. They have ruled everything from revenge thrillers to zombie films and seem to be doing it better than just about any other country. 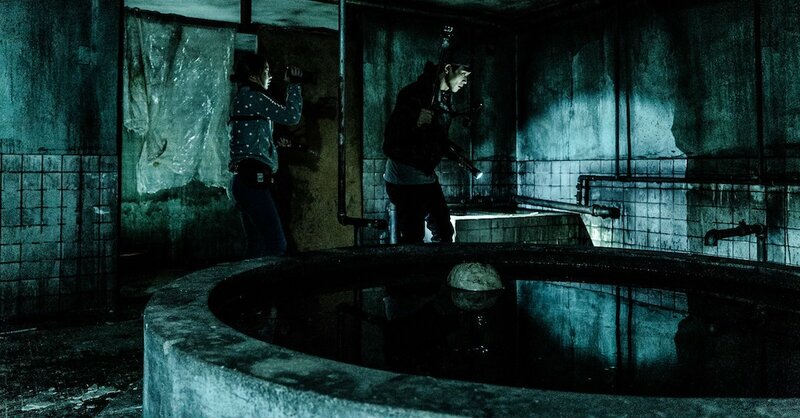 So when I heard about Gonjiam: Haunted Asylum, I was legitimately excited to see what was in store. I had high hopes of seeing something original and genre defining like The Wailing… what I got was another dull and predictable movie where we spend twenty minutes explaining how the gear works. My intro is a little brutal, but this is not a terrible movie. It is competently made and well-acted, its just boring. The scares are typical to the sub-genre and it can be a slog trying to make it to the action. I hoped that these tropes were going to pay off into something better, but it ended in a way that you would expect. What is enjoyable is the background story to the asylum, itself. The filmmakers so a great job of building lore and wish that it would have paid off better. Based on the mostly positive ratings that I am seeing, I am definitely in the minority. You never know, you might dig it… but I think if you are in the mood for a solid found footage movie, there are already enough other movies to pick from. Gonjiam: Haunted Asylum is currently available on DVD and VOD from WellGoUSA.